Yes, that is absurd, and in no way represents how the majority of people think about important life decisions. It’s hilarious though when framed in those terms. We have Prof. Richard Thaler to thank for that comment, a perfectly constructed, wry jab at much of traditional academic economics. If humans are utility-maximizing automatons, doing calculations in their head constantly, how can anyone argue with his quip? At Greyfeather, we were very pleased to see Prof. Thaler (University of Chicago) get the recognition this past week that he so rightly deserves – the Nobel Prize in Economics. Thaler, in his own words, said that his contribution, “[..] was the recognition that economic agents are human, and that economic models have to incorporate that.” In academia for much of the 20th c., the idea that humans couldn’t be modeled as perfectly rational optimizers was pure heresy. Ironically, most of the academics at the institution where Thaler has spent much of his career (U Chicago) disagreed with the spirit as well as the content of his work, including Eugene Fama (father of factor models, efficient market hypothesis, etc.). 1. De Bondt, Werner F.M. and Richard H. Thaler. "Does the Stock Market Overreact?" 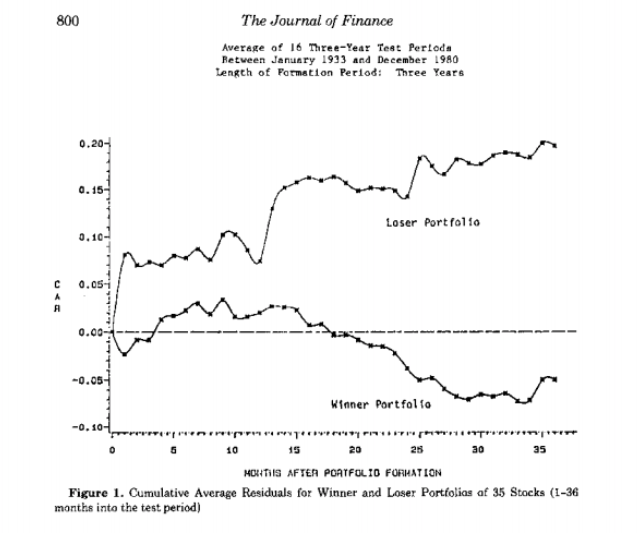 Journal of Finance 40, (1985): 793-805. Perhaps the most extreme over-reaction has been demonstrated in the recent asset price bubbles and crashes in recent memory: the dot.com bubble and subsequent collapse, real estate prices pre-2008 and the ensuing financial crisis, flash crashes, 1987, etc. etc. Yes, some of those were affected by computerized trading systems, portfolio insurance, etc. – however, all the code was written by humans, and the end result of it was irrational. Participants, whether human or automated were reacting to other participants and not information regarding the future capacity of companies to make money and pay dividends. Thus, in our view, the point still stands. 2. De Bondt, Werner F.M. and Richard H. Thaler. "Do Security Analysts Overreact?" American Economic Review 80(2), (1990): 52-57. It’s not that humans are fools, it is just that we tend to get too excited from recent developments. We’re all guilty of doing it in various contexts, and that is one of the main reasons for using a systematic approach to investing, one that is underpinned by data and repeatable processes. The above examples are only a select few. His work is timeless though and we encourage everyone who plays in markets - of any kind - to read Thaler thoroughly - it could potentially spare you from the next (ir)rational market cycle. On 28 Mar 2017, I gave a presentation at the Battle of the Quants Conference in Frankfurt, Germany on how investors should assess AI-based investment strategies. The contents of the talk formed the basis for the white paper, "Artificial Intelligence Simplified: A Framework for Assessing AI-based Strategies." This white paper presents a framework for assessing investing/trading strategies that are driven by Artificial Intelligence (AI). Considerable hype surrounds the technology and that is to be expected given not only its capability today but what might be expected of AI in the future. This environment poses difficulties for investors and allocators who are trying to assess AI-based strategies in the present. Distinguishing hype from reality is the starting point. Then, investors must focus not on the technical aspects of the technology in all its various forms, but on what particular mispricing or inefficiency the strategy exploits, and the way in which AI enables the discovery and capture of such alpha.